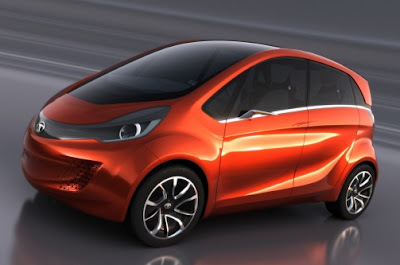 Tata Motors today presented its all-new concept car 'Megapixel' at the 82nd Geneva Motor Show in Geneva. This is a new four-seater city-smart global range extended electric vehicle (REEV) concept for the performance-seeking and environment-conscious motorist anywhere in the world. Combining a lithium ion phosphate battery and an on-board petrol engine generator for recharging on the move, the Tata Megapixel offers a range of up to 900 km (with a single tank of fuel), path-breaking CO2 emission of just 22 gm / km and fuel economy of 100 km / litre (under battery power). The class-leading ‘Zero Turn’ drive system of the Tata Pixel (shown at the 2011 Geneva Motor Show) has been taken to an even higher level of manoeuvrability in the Tata Megapixel. The car’s electric drive has four independent electric motors, one at each wheel. When parking, the electric hub motors drive the wheels in opposite directions, while the front wheels are turned at an acute angle, enabling an exceptional 2.8 metre turning radius. The at-home charging system is an innovative induction charging system. The car has simply to be parked over the induction pad for charging to begin. The Tata Megapixel is as distinctive in elegantly melding Indian uniqueness – in colours, graphic themes or materials – with global styling preferences. The integrated lamp and grille graphics sweep back over the front wheel arches to render a dynamic front end. It is echoed on the panoramic roof, creating a harmony between sun & shade and sense of interior space. The floating C-pillar and wrap-around belt line finisher integrate perfectly with the sculpted body surface, flowing freely to the rear and encapsulating the 5-spoke wheel design. A double-sliding door system and the car’s B-pillar less design make entry/exit easy, besides superb visibility. The battery layout and hub motors maximize the interior package. So, the Tata Megapixel comfortably accommodates four adults with luggage. The front seats are cantilevered on the central tunnel, releasing floor space for additional storage. Light leather trims and rose metal details accentuate the joyous marriage of richness of tradition and innovativeness of technology. This fusion is heightened by an advanced human machine interface (HMI). The console docking point can connect a smart phone with the car. The built-in large touchscreen HMI, at the centre of the instrument panel, thus becomes a common access point for the repertoire of the smart device and for controlling the functions of the car, like temperature, ventilation, driving modes and performance. Tata Motors’ displays also include the new generation Tata Safari Storme SUV, the Tata Aria crossover, the Tata Indigo Manza sedan and the Tata Indica Vista hatchback.